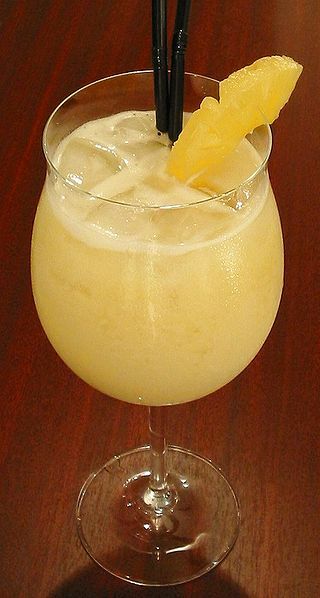 The piña colada (Spanish, "strained pineapple") is a sweet, rum-based cocktail made with hard rum, coconut cream, and pineapple juice, usually served either blended or shaken with ice. It may be garnished with a pineapple wedge or a maraschino cherry. The piña colada has been the official beverage of Puerto Rico since 1978. Put all ingredients into an electric blender. Blend at a high speed for a short length of time. Pour into a Collins Glass and serve with a straw. Add decorations (e.g. wedge of pineapple, maraschino cherry, tiny umbrella) if wanted. Staten Island Ferry - coconut rum and pineapple juice over ice.